The aim of this book is to analyze Japan's high-growth economy, in particular to clarify the kinds of changes in people's lives that were generated by high growth. The present volume focuses not on the macro-economic mechanisms that expanded the scale of the economy, but on the micro-economic changes that were effected in everyday life. The emergence of a mass consumption society as a result of economic growth suggests that people's lifestyles and consumer behavior changed in various ways. The first chapter focuses on the apparel industry's expanding market as it corresponded to changes in consumer behavior. Even as consumer life became more comfortable and abundant, consumers were becoming uneasy about the environmental deterioration associated with high growth. The second chapter examines how the Japanese government addressed emissions regulations while drawing on the lessons of America's experience with the same issue. The change in industrial structure brought about by economic growth inevitably resulted in the decline of other industries. Chief among these was the coal-mining industry, which, with the onset of a full-scale energy revolution, lost its role as energy supplier owing to the import of cheap crude oil. The third chapter discusses the government's industrial policies as they addressed the coal industry's adjustment in the high-growth era, concluding that they reduced such problems as stagnation, unemployment, and local industrial decline. The adjustments in employment practices contributed positively to the gradual shift of labor from declining industries to growth industries. The fourth chapter investigates changes in labor management in the steel industry, which was one of the high-growth era's leading industries. 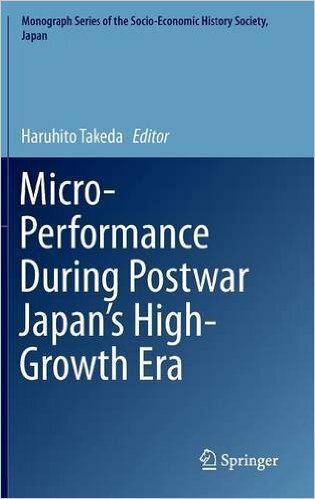 This publication will serve as a valuable resource for those who are interested not only in the post-war history in Japan but also in high growth economies in recent East Asia.